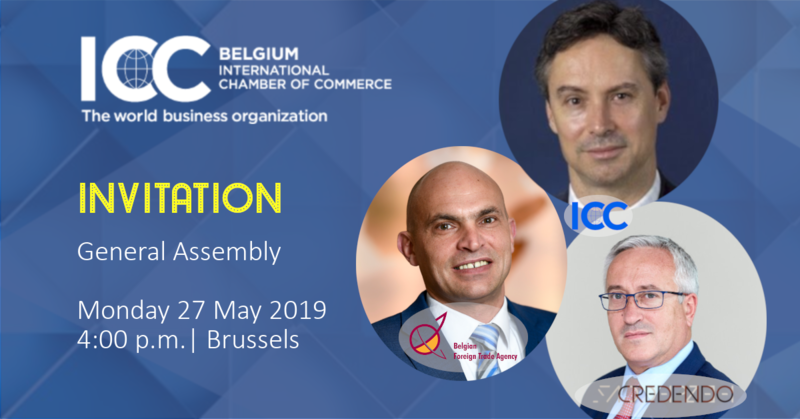 If your company or organization is a member, you are invited to participate to ICC Belgium’s General Assembly on Monday 27 May 2019 from 4:00 p.m. until 5:00 p.m. The meeting will take place within the premises of the FEB. After the meeting you will have the opportunity to catch up with other members of ICC Belgium during a cocktail. The meeting will be enhanced by a presentation on the opportunities of the new ICC Geneva office to engage with the UN system. The following presentation will focus on the risk trends in international trade and the role of Credendo – the Export Credit Agency- in preventing these risks for companies. The final presentation will explain the role of the Belgian Foreign Trade Agency with an emphasis on the Regulatory Department. Crispin Conroy, ICC Representative Director of ICC Geneva : Opportunities of the new ICC Geneva office to engage with the UN system. Nabil Jijakli (tbc), Group Deputy CEO Credendo and Deputy CEO Credendo – Export Credit Agency : The risk trends in international trade and Credendo’s role in preventing risks for companies. Didier De Baere, Deputy Director-General of the Belgian Foreign Trade Agency : Presentation about the role of the Agency with an emphasis on the Regulatory Department. How to confirm your attendance? All the necessary documents will be sent in due time to the members that have registered. to be a proxy to attend and vote on my behalf at the annual General Assembly of Monday 27 May 2019 and at any adjournment of the meeting.